Great Z's: Anesthesiologists Are In Great Demand. Not! Merritt Hawkins, a national physician recruiting and staffing firm, has a ringside seat to the physician jobs market. Their ability to recognize the need for doctors and capability of fulfilling those needs allows them to judge the market place better than most. The company has just published a white paper on what they see are the doctors who are most in demand at the moment. Ranked by the percent of job openings relative to the total number of physicians in the field, MH has ranked Pulmonology as the most sought after medical field in the country. That is followed by Psychiatry, Dermatology, Family Medicine, and Neurology. What do those specialties have in common? They are either in primary care, which is always in demand, or in specialties with very low number of training programs, thus keeping their skills highly prized. Where is Anesthesiology in this list? You'll have to look way, way, way down at the bottom of the graph. 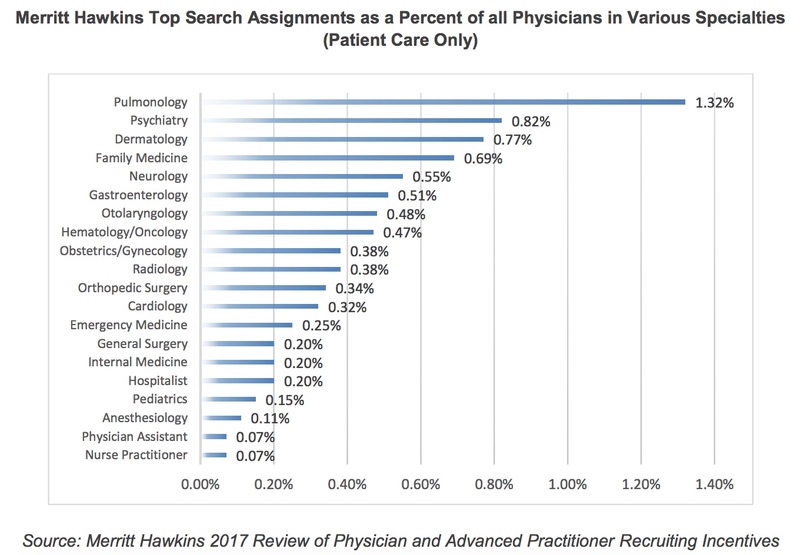 According to Merritt Hawkins, compared to the total number of practicing anesthesiologists, the number of job openings is only 0.11%. So for every 1,000 anesthesiologists working, there is only one job opening. Just one. 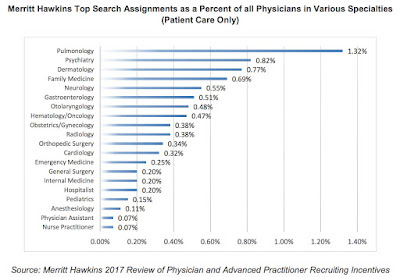 Anesthesiology have the fewest job openings relative to the number of practicing specialists of all medical doctors. We are ranked just above Physician Assistant and Nurse Practitioner. Now these numbers sound a bit suspect. It's not plausible that out of 50,000 anesthesiologists that are in the ASA, there are only 50 job openings. Or is it? The anesthesia residency programs keep adding more new anesthesiologists every year, currently well over 1,000 each Match Day. And the numbers are still rising. By comparison there are a little over 500 Pulmonary fellowships offered each year. With the population rapidly aging and their complicated pulmonary issues, it's no wonder pulmonologists are being eagerly recruited. The only way for that many new anesthesiologists to find jobs is if nearly the same number of anesthesiologists start retiring each year. Even if the absolute numbers are not entirely accurate, anesthesiology's ranking relative to other physicians should make any anesthesiologist pause. There are only so many surgery sites for anesthesiologists to work. With the constant encroachment of CRNA's, pretty soon we'll have to start competing with them directly for job openings. Will employers care that we have thousands of hours more training than the nurses or will they only look at the bottom line and lower the salary offered? In a true market economy, you already know the answer.